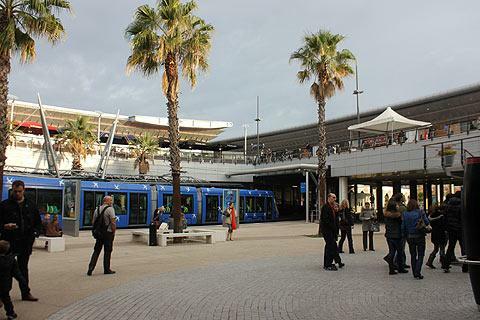 Montpellier's new Odysseum district has been built in a fun modern style giving it something of the aire of a Miami shopping mall. 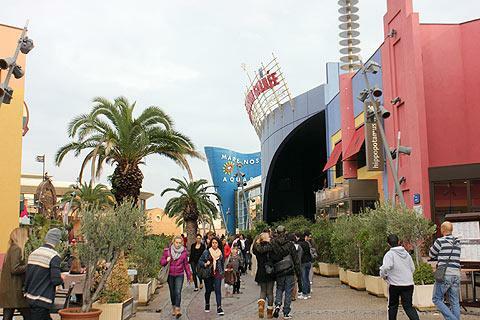 It combines shopping with a number of leisure pursuits including an ice rink, a planetarium and an aquarium. It is to the east of Montpellier's centre on tramway line 1. Whilst the palm trees and bright colours give it a distinctly Florida-feel it also continues the Greek theme started in the Antigone district a little to the West of Odysseum (on the same tram line) and the Theatre Helios built in ampitheatre style and offering a place to sit and relax is at the heart of the development. The Odysseum district offers a large shopping centre with all your favourite shops including H&M, Zara, the Apple Store etc. The tram arrives into the shopping centre itself and so no worries about long distances to walk whilst carrying your shopping. Take tramway line 1 which is the blue line with the white swallows painted on it and stay on it until the end - it terminates at Odysseum. There is also plenty of parking with the first 2 hours being free and the Odysseum is easily accessible from the A9 motorway. All in all 100 different shops plus a hypermarket - Casino Geant. The shops are open from 10.00-20.00 Monday to Saturday with Casino Geant open from 09.00 to 21.00 Monday to Saturday. At the heart of the planetarium is a large viewing room with a huge semi-circular screen allowing you to be totally absorbed in the sight of the galaxies and planets which surround the Earth. There are also various programmes for different ages including different films and cartoons for children. There are also documentaries and reconstructions of life as an astronaute and the early years of space travel. The Planetarium is just outside the shopping centre at Odysseum and is open every day during school holidays and weekends and Wednesdays outside of holidays. The Planetarium opens at 1.30pm. Tickets cost 6.30€ for adults and 5.30€ for under 12s. 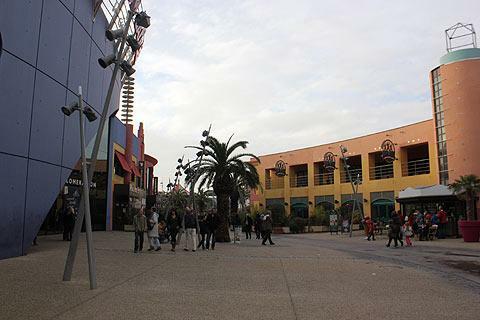 The Mare Nostrum Aquarium is just outside of the Odysseum shopping centre. It has lots of displays of marine life throughout the world including one gigantic tank of 18m x 9.5m - one of the largest in Europe. Altogether there are more than 400 species to see and there are even simulations of hurricanes and being on board a boat lost in a South Seas storm. A visit to the aquarium takes about two and a half hours to see everything. The Aquarium is open all year from Sundays to Thursdays 10.00-19.00 and Fridays and Saturdays 10.00-20.00. From the 2 July to 28 August the Aquarium is open every day from 10.000-22.00. Prices are 15.50€ for adults and vary with age for children from 7.50-12.50 €. There are various different price combinations including family tickets (2adults + 2 children) for 42.50€. With 40 bowling alleys plus 6 designed for small children the Odysseum bowling alley is a large bowling centre. However there is also an indoor karting track and a billiards room plus a soft play centre for under 3s. There is also a bar and a snack bar. The Bowling and Karting centre is open every day from 12 (midday) to one o'clock in the morning on Sunday until Thursday and until two and three am respectively on Friday and Saturday. Bowling costs between 4 and 7 euros and Karting costs 15€. 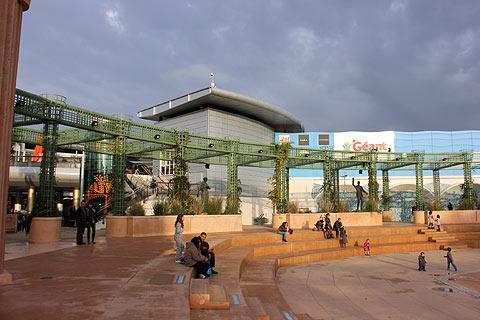 Also in the Odysseum complex is a large ice rink which is the first in France to be built with additional fun elements to the main rink - this includes an area with a slope, an ice-slike and a tunnel to skate through with multi-coloured lights. A DJ makes sure that music adds to the fun. The rink is closed on Tuesday mornings during school holidays but open morning and afternoon apart from that (closed for lunch) and open 3 nights a week. Outside of school holidays it is open every evening and some mornings. Prices are 5€ for adults and 4.10€ for under 16s with skate hire of 2.70€. Other activities at the Odysseum include a huge climbing wall to test your courage and a mini attractions park for young children. There is a large choice of restaurants and bars and even an Irish pub with live music most nights. 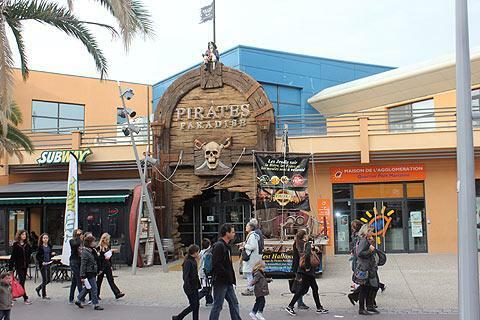 Children will love the 'Pirates Paradise' a pirate themed restaurant. There is a large arena-style open area where you can sit and relax in between shopping and activities. It is surrounded by statues of famous figures from history: Mao, Nasser, Golda Meir, Gandhi, Mandela, Lénine, De Gaulle, Churchill, Roosevelt et Jaurès. The historic centre of Montpellier is beautiful and not to be missed if you are nearby. The Antigone district of Montpellier situated between Odysseum and the centre is also worth visiting. Obviously the Mediterranean coast and the nearby coastal towns of Sete, La Grande-Motte and Le Grau-du-Roi are worth a visit.